Following up on my post last time on money saving tips for your garden, today we’re going to talk about how to get the most productive vegetable garden. Gardening doesn’t do much good if it produces no yield. Here are some tips that can help you get the most ROI (return on investment) out of your vegetable garden. In the past, we’ve been pretty consistent about planting our garden, having that “new garden excitement”, and then, in about four weeks or so, the excitement wears off, and we start neglecting our garden, letting weeds grow, not watering, etc. Since we’ve moved from the suburbs to the farm, though, we’ve got a whole different goal in mind for our garden. It’s not just a neat little activity anymore: our goal is to provide our family of six vegetables for the entire year. In order to make this work, we have to be committed to caring properly for our garden, and if you want to have the most productive vegetable garden you can, you have to be committed to caring for it properly too. Water it regularly, making sure that the soil doesn’t get real dry. Remove weeds often, as they choke out garden vegetable plants and can kill them off if left to run rampant. Keep your garden safe from critters by putting up a fence, using other “fear tactics” like planting marigolds on the border of your garden or sprinkling blood meal throughout your garden, or setting up pinwheels (reader tip: those shiny, spinning pin wheels you played with as a kid? Most rabbits are terrified of them!) around the plants rabbits and other critters wander toward most often. If your family eats green beans like they’re going out of style, plant an abundance of green beans. If broccoli is the household favorite, load up on broccoli. Pick the four or five most bought/eaten plants in your household, and load up big time. In our case, we love salads, so there’s lots of lettuce growing around our property, both in the garden, and in pots here and there. By planning your garden around which vegetables you eat the most, you can maximize garden yields and save a ton of cash in the process. The most productive vegetable garden in the world will be pointless if you throw away a large percentage of what you’ve grown. Make it a point to learn all that you can about food preservation, especially on the products you eat most. We love pickles and salsa at our house, and used to buy lots of both of them at the stores. However, now that we’ve learned to can both pickles and salsa, we no longer need to buy them at the store. Bonus? The home-canned stuff, once you’ve perfected your recipe, tastes MUCH better than store bought. The same rules can apply to freezing vegetables. Blanching and freezing is a pretty simple and quick process once you’ve learned the techniques, and now that we know how to do it (any basic comprehensive cookbook will show you how to freeze and can food), we stock our chest freezer with an abundant supply of green beans, peas, green peppers, onions and carrots. Even last year, when we didn’t care for our garden nearly as well as we should have, we stocked up a good couple of months’ worth of each of the vegetables listed above by blanching them and vacuum sealing them. This year we’re planning on freezing ten-fold what we froze last year. Don’t have an abundance of space or time for a garden? 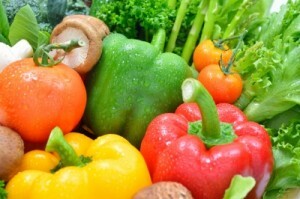 Pick one or two of your favorite vegetables, and have a friend/family member pick two others. Tend to them well, and then when harvest time comes, you can work together to preserve your bounty, and split the proceeds. Vegetable gardening is always more fun with a friend or family member to share the experience with. Having the most productive vegetable garden you can doesn’t have to involve a plethora of work. By following the gardening tips above, and doing a little bit each day to care well for your garden, and manage your harvest too, you can reap a great harvest for your efforts. What have you found that helps you have the most productive vegetable garden? What do you do in order to keep pests out of your garden? We have a small garden in front of our house. We have bell pepper, ginger, chili and tomato. My neighbors who have a wider vegetable garden compared to us and they really made a good money from it. Every time I read something you write about gardening, Laurie, it inspires me to do more of it. We have begun the basic process this spring actually and we are starting with herbs and peppers (because we love them and yet they are so expensive in the stores). The herbs have taken off and I joke that my hubby is going to have to have a mojito summer with all of the mint that is growing. We are still waiting on the peppers. I REALLY can’t wait until I have the space to grow something significant. In the meantime, I really need to plant my pot of herbs for the summer. I don’t have the space for a garden (Building Living), but hanging tomatoes sounds appealing. I will have to buy a few pinwheels for my father’s garden. Thanks for the tip and good luck. We planted out first vegetable garden this year and were disappointed to find that some bunnies ate all our broccoli! We had to replant it and buy some mesh fencing to go inside of our regular garden fence. It has worked though- no one has munched on our veggies since we put up the second fence. You could try the pinwheels too – one of my TFF readers swears by this trick. 🙂 We had bunnies eat all of our lettuce last year, and were so bummed! This year we put a pinwheel in the garden by the lettuce (so far, so good) and we also put 4 potted lettuce plants up high, out of the bunnies’ reach. We’ll see how that works. Sounds like fun, Liz! We are going to do raspberry jam this year, hopefully. My sis in law made hot pepper jelly and it was super yummy! Just like you, it was exciting for me at first but then the excitement wore off, and I got distracted… I’m trying to get back on track again, so hopefully we can harvest some good vegetables this year! I just planted a small container garden with some cherry tomatoes, cilantro and parsley. Living in Phoenix is a bit of a challenge to growing anything really but especially vegetables. I hope to make a serving or two of pico de gallo and enjoy a marguarita on the patio! Oooh, that sounds wonderful, Paul!! Given the climate there, I think you made a wise choice. Cherry tomatoes usually produce a huge yield too, so that will help. And, if you buy green onions and keep them in a glass of water, snipping off the tops as you go, they’ll continue to grow, I’ve heard!